Private lessons are a great opportunity to work at your own pace with specialized instruction in a one on one setting. Lessons are scheduled based on the schedule of the student and instructor. Once the private lesson has been requested, a SHOW staff member will get back to you within 24 hours with more information. All private lesson clients must have a Pike 13 account with us. Click the button below to create an account, if you don't already have one, before requesting a private lesson. 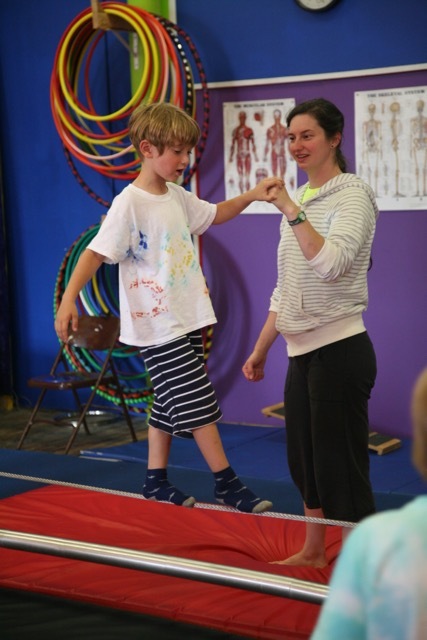 We offer private lessons in trapeze, juggling, fabric, diabolo, unicycling, contortion, juggling, stilt walking, lyra, rope, partner acrobatics, aerial yoga, aerial duos, clowning, hand-balancing, tightwire, and much more. A typical private lesson runs for 1 hour but more or less time can be requested. All skill levels are welcome. Please click on the button below to fill out our online form to request a private lesson. We offer 30 minute private lessons for youth ages 7 - 16. The 30 minute youth private lessons cost $30. We do not do reoccurring private lessons for students 6 and under. We provide 30-minute student class placement/evaluation lessons to ensure proper placement for new or returning students. Placement/evalutation lessons cost $30. Please note that we provide placement/evaluation lessons for ages 3+ but that we do not provide reoccurring private lesson for ages 3-6.